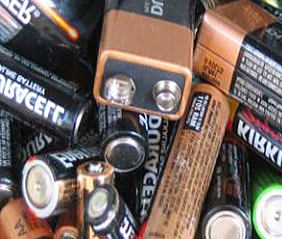 Members of the public should not place batteries in waste disposal or recycling bins. Waste batteries should be collected and returned to the retailer who sell equivalent batteries or to a local authority civic amenity sites. No purchase is required to return waste batteries. Retailers must take back batteries similar to a type they sell such as portable batteries such as AA, AAA, Cell C, Cell D, PP3. If you do not sell Automotive, Industrial, or sealed lead acid batteries for alarms you are not obliged to accept these back. Take-back systems for household batteries may operate in conjunction with take back systems for household WEEE. Retailers of automotive or industrial batteries must register as a supplier of Batteries under the WEEE, with local authority. See forms below. Retailers may deposit waste portable batteries free of charge at local authority civic amenity sites. Retailers are prohibited from placing on the market, batteries supplied by an unregistered Producer. Retailers who import batteries from outside the state are required to register as a Producer. The collection compliance scheme in operation within Tipperary County Council's functional area is WEEE Ireland. WEEE Ireland can be contacted at 01- 299 9320. 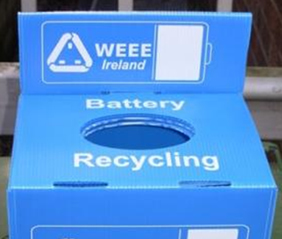 WEEE Ireland have prepared an information pack for both retailers and the consumer. Please click on the link below for further information on these regulations. Automotive batteries can be recycled at Nenagh, Roscrea, Cashel and Clonmel Civic Amenity sites only.